I’m still recovering from oral surgery and sinus infection but feeling better. I’m eating probiotic fermented foods like kombucha, kefir, sauerkraut, black garlic, pickles. Also taking probiotic capsules, drinking ‘green food’ -not even sure exactly what it is- and I’m using a neti pot. Will evaluate tooth replacement and sinus congestion after stitches are removed tomorrow and swelling recedes. No strength or will to build bikes right now and in fact today I rode the Dahon folder to Bob’s for rear coaster wheel replacement; $52 estimate for new wheel, swapping the cog, swap tube and tire and adjustment. Considering I have only about $100USD in it, I can justify spending more. The new wheel is black and silver and will be very fetching on the Dahon, matching the new Cloud-9 gel seat which so far seems comfortable enough, at least for short trips. 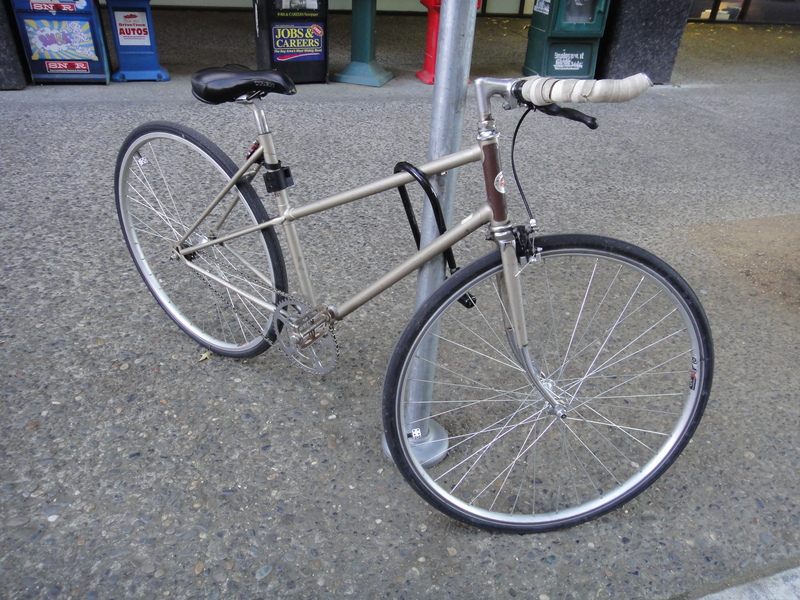 I’m planning a rear fixie wheel for the poor Schwinn mixte frame so I am not stuck, God forbid, with only one bike to ride. 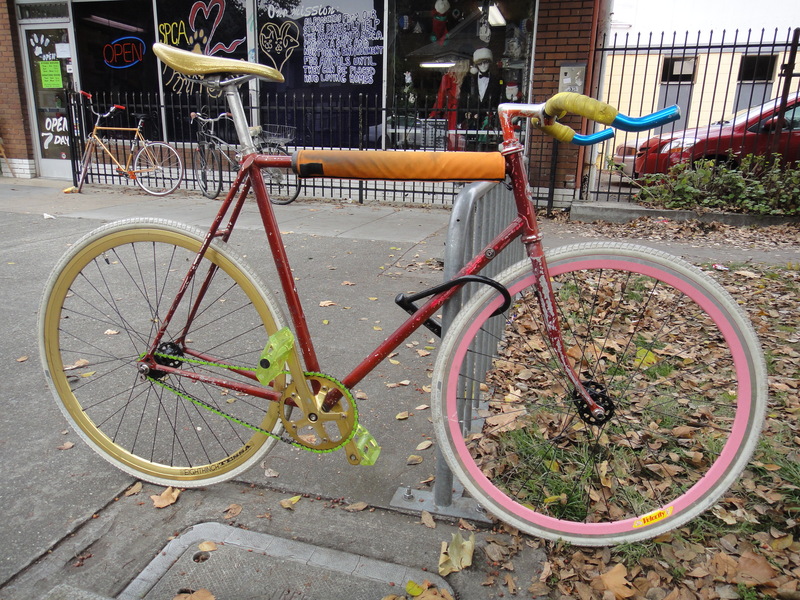 It’ll require swapping axles and spacers for a good chain-line, and then dishing the wheel to center it in the frame. Another fun part of 1-gear bike building really. Sale prices forced me to retire my old Sony underwater camera and buy a new Sony Alpha 3000 mirror-less digital camera at Best Buy. I’m using it and will report soon. Looks like former ball player Dennis Rodman had a bit of a breakdown and took refuge in alcohol rehab. Cold turkey has been shown to be the most effective method, they say. Best of luck Dennis, you’re better off out of it, and also off of it. Thanks for your service. 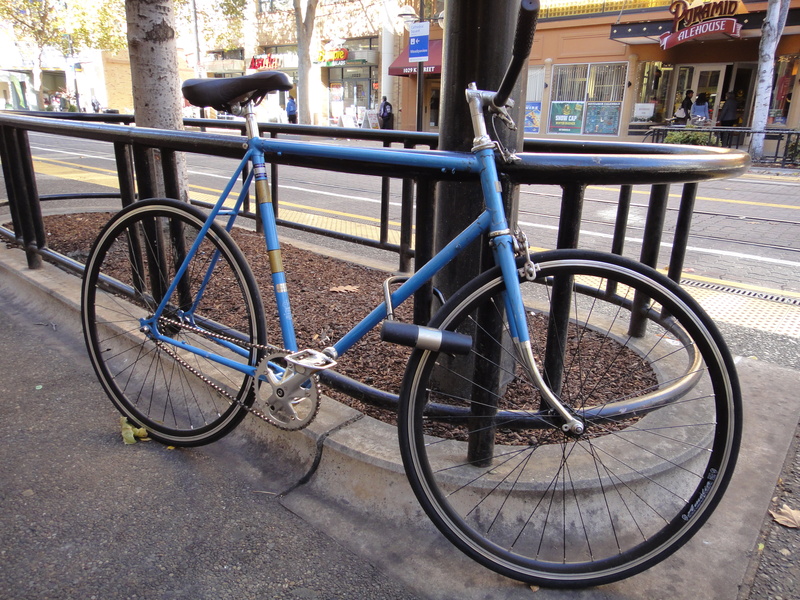 Meanwhile here are some 1-geared bikes seen on the streets of Midtown and Downtown Sacramento circa late 2011.